Oversee all supply chain functions, including scheduling, logistics, planning, and purchasing, with an annual $300 million spend. Lead 32-person staff with eight management-level direct reports. Implement and champion Lean manufacturing principles (focusing on variation and cost reductions). Emphasize the importance of individual contributions to safety, quality, delivery, and cost; provide Six Sigma training and certification (5 Black Belts and 140+ Green Belts as of March 2010). § Process Enhancement - Developed third-party logistics to maintain a forward-stocking location and ensure inventory availability which resulted in over $1M savings annually. oWorld-class safety performance of <.97 TRIR. oQuality and productivity improvements of 30% and 25%, respectively. oFinancial results that were 4% under target, despite troubled economy, multiple lay-offs, and non-budgeted restructuring costs. Oversee core business and operational development functions (e.g. purchasing, master scheduling, tooling, manufacturing engineering, facilities, continuous improvement and information technology) within manufacturing operations. Supervise staff of 45 and direct systems implementation to support the production of jet and single engine piston aircraft. Challenged to initiate improvements for under-performing areas, including product deliveries, inventory control, and team output. SELECTED ACCOMPLISHMENTS Performance Improvement - Improved on-time delivery from 56% to 98% in 1 year by implementing project planning system based on teamwork, quality and customer satisfaction goals. Additionally, reduced safety incidents by 85% by developing a culture for safety awareness. 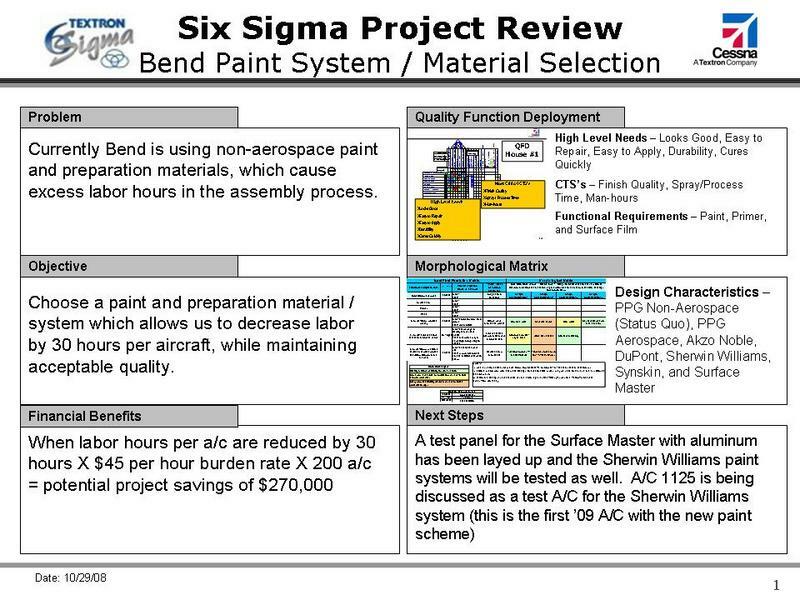 Process Enhancement - Reduced overall paint process time by 20% by implementing a new aerospace paint system, resulting in over $500K annual savings and up to 25 pounds per aircraft savings. Product Development - Led teams in plant move activities ($1M under $9M budget and 3 months ahead of schedule) which included; moving parts, equipment and tools domestically and internationally (ensured ITAR and EAR compliance). Additionally, transferred process knowledge domestically and internationally. 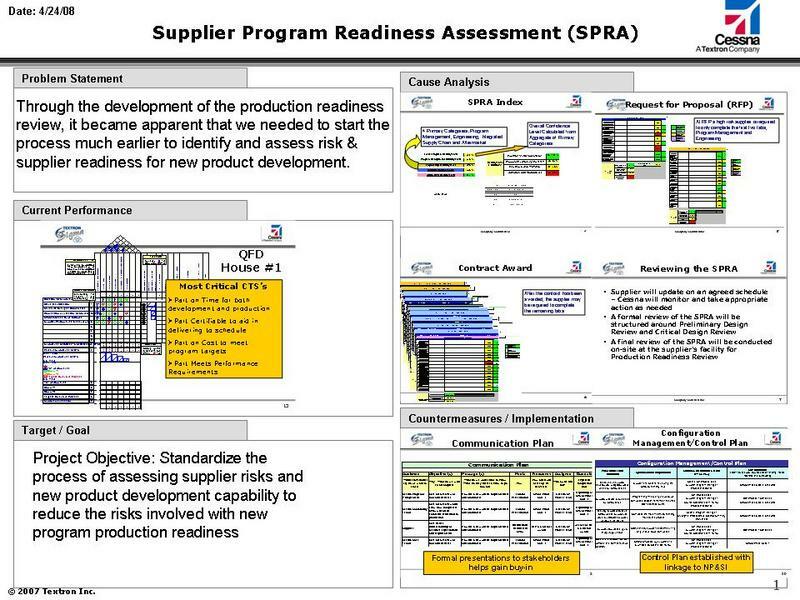 Operations Reengineering - Improved supplier readiness on new program development 18% by implementing a Supplier Program Readiness Assessment tool. Managed a group of Quality Engineers responsible for improving the overall Cessna supply base. 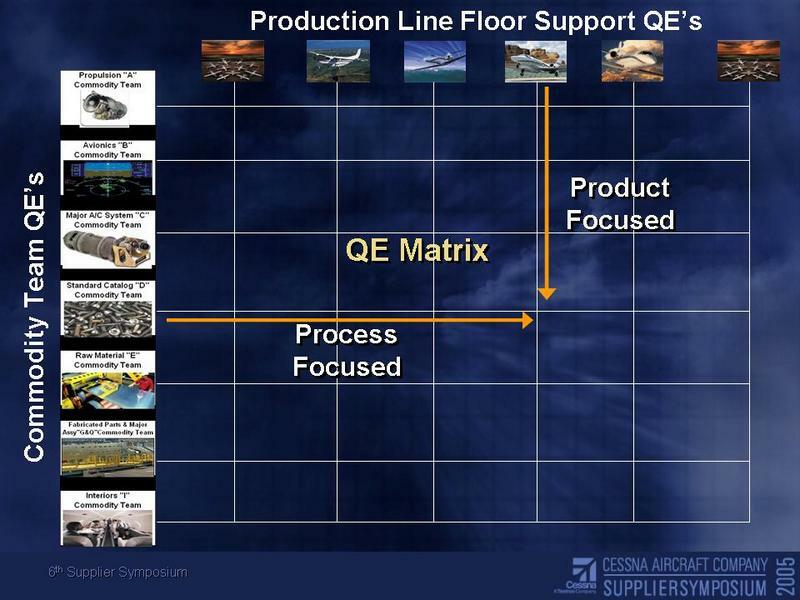 Worked with several cross-functional teams, to improve processes at Cessna and suppliers. Developed metrics, to measure performance of employees against their goals. Implemented major improvements to the Cessna Quality Assurance Manual, which allowed better allocation of resources. SELECTED ACCOMPLISHMENTS Performance Improvement - Improved supplier PPM (Parts per million defective) 83% by working with supplier to improve their root cause analysis and process management. Operations Reengineering - Reduced the overall supply base 60% by categorizing suppliers as growth, provisional and phase out, which led to better overall supplier performance. Process Enhancement - Improved the special process audits at suppliers through participation in Nadcap and collaboration with other aerospace primes to develop a standard auditing process.